Kinshasa (Agenzia Fides) – Fr. Célestin Ngango, parish priest of Karambi kidnapped on Easter Sunday, on the road between Nyarukwangara and Karambi, in the territory of Rutshuru, in the province of North Kivu in the east of the Democratic Republic of the Congo has been released. The priest was found around 3 am on April 5, by some villagers from Bunyangula, which is 2 km from the city of Rutshuru. The kidnappers had left Fr. Ngango blindfolded. According to local authorities, the priest was released by the criminals as a result of strong pressure from the inhabitants of the area. 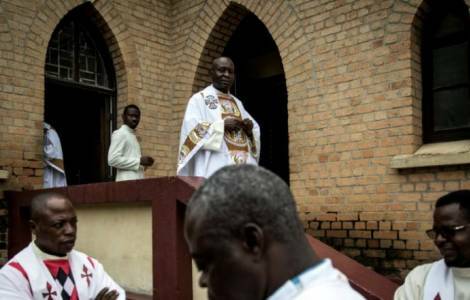 According to a statement from the National Episcopal Conference of Congo (CENCO), sent to Agenzia Fides, "the priest released was not mistreated and his health conditions appear good. However, he will be subjected to medical tests". In an interview with Fides (see Fides 4/4/2018), His Exc. Mgr. Théophile Kaboy Ruboneka, Bishop of Goma reported that the kidnappers had contacted the parish of Don Ngango, using the priest’s cell phone, initially asking for a ransom of $ 500,000 then reduced to 50,000. After the abduction, the parishioners all got together and went into the forest to try to find their curate, but were unsuccessful. It therefore seems that the strong popular pressure forced the kidnappers to release their hostage. There is no confirmation of a ransom. On 3 April, in a statement, CENCO strongly condemned the kidnapping of Fr. Ngango and asked for his immediate release. "Priests are people consecrated to God to serve others", says CENCO. "Preventing their work means depriving many of our compatriots of numerous benefits". As Mgr. Ruboneka recalled in his conversation with Fides, in North Kivu "kidnappings happen daily. This is an ongoing tragedy caused by an inhuman business", which does not even spare women and children.